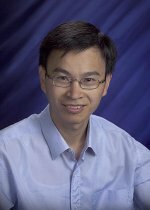 Congratulations to Pacific Northwest National Laboratory's Dr. Wei-Jun Qian, who received a 2009 National Institutes of Health Director's New Innovator Award. The award is given to stimulate highly innovative research having the potential for significant impact and support promising early-career investigators. The award, which includes a $1.5 million, 5-year grant, will support Qian's drive to make new research and clinical diagnostic tools that are dramatically more sensitive, reliable and faster than current technologies. His application was for "A Universal Multiplex Assay System for High-Throughput Clinical Applications." Qian's research involves developing and applying novel mass spectrometry-based proteomics approaches for quantifying changes in proteins from mammalian cells, tissues and biofluids. This work is helping the scientific community gain a better understanding of cell signaling and discovering novel mechanistic or diagnostic protein biomarkers for human diseases. For more information, see PNNL's news release.